This forum is, as of the time of writing, focused entirely too much on fragment (pixel) shaders, and is ignoring the possibilities offered by vertex shaders. This is silly, so I put about an hour into making a nice, pretty vertex shader to demonstrate what you're missing. With that in mind, I made a dual-quaternion skinning shader. In simple terms, it facilitates skeletal animation without some of the artifacts caused by linear skinning. Customizable features. Skinning can be easily disabled, as can the tangent-space calculation, etc. Up to 3 bones/blend weights per vertex (48 total bones possible by default). World-to-tangent space calculations, for effects such as relief mapping. //  Dual-quaternion skinning shader. Supports 3 weights and tangent-space. //    0:  Quality only acceptable for rotations of 180 degrees or fewer. //    1:  Good quality on the full range of rotations. //  Specifies the world transformation to be used. //  Send a tangent-space eye vector (eye - position) to the fragment shader. //  Send an orthonormalized basis for the tangent-space to the fragment shader. //  Send world-space position to the fragment shader. //  Vertex data is specified in neutral-pose space. //  space. The basis passed to the fragment shader is generated from these. attribute vec4 in_Normal;       //  xyz = V (Binormal), w   = 3rd blend index. Must be non-zero. Negate if tangent-space is left-handed. attribute vec4 in_TextureCoord; //  xy  = Texture,      zw  = 1st and 2nd blend weights. Third is implicit: 1-(z+w). //  Texture coordinate, for texturing purposes (duh). //  World-space location of the given fragment, to simplify lighting calculations. //  Tangent-space eye vector. To be more precise, this is a vector from the fragment to the camera. //  Tangent-Binormal-Normal matrix, forced to be unitary because typical normal maps rely on it. //  xyzw -> xi + yj + zk + w.
//  Unpack nuetral-pose (pre-transform) data, for convenient access. //  Blends are transformations from pose-space to object-space. //  First, linearly interpolate blends by weight. //  Dual quaternions may have a dual norm, but it is more expensive to compute. //  Additionally, the dual part of the quaternion has no effect on the real (rotation) part of the norm. //  Blend is applied as rotate, then offset. Dual does not affect rotation. //  Calculate vertex position, in object-space. //  This moves position from object-space to world-space. //  This moves position from object-space to projection-space. //  Create the transformation from tangent-space to world-space. //  Generating the normal from the tangent and binormal gives correct results under non-uniform scaling. //  Transform the eye vector into tangent-space. Requires inverse of TBN. //  Create the unitary matrix for normals. //  Simple normal-mapping fragment shader. //  Scaled, to avoid noise at grazing angles. //  No division by zero on my watch. //  Use martini stepping instead of a linear search. //  By storing the square-root, I get better precision for small cones and less damage from linear interpolation. //  The usual implementation of relaxed cone-stepping provides good convergence when the ray overshoots a peak, but has cases of slow convergence. //  The essence of martini stepping is to use a union of cone and cylinder (hence the name). The cylinder will have radius <= cone radius at depth 0. //  Want to try a linear search instead? Uncomment this. //  Cylinder mapping permits rays to punch through the floor. This corrects such situations. //  Next, refine the point using a binary search. //  Once "close enough" to the final point, secant method can smooth results. Note: By saving old data, I could get this down to 1 texture fetch. //  I could normalize it, but it should be pretty close anyway. Discard the features you don't plan to use. If you're not planning to use something that requires the surface's tangent-space, for example, then get rid of that part of the code. Code your fragment shader. It could be a simple passthrough shader; it could be normal-mapping, parallax mapping, etc. Set up the custom vertex format. If you haven't modified the way I use vertex attributes, this will be 4 4-float vectors, with component-use specified in the comments in the vertex shader. Set up your model. Each vertex will require the vertex's position (in the neutral pose), the indices of the bones it uses, the weights of the first 2 bones (the third is defined implicitly to force them to sum to 1), and (if you've left the shader as-is) the tangent and binormal. (Recommended) Freeze your buffer after setting up your model. If your animations are skeletal, you shouldn't need to modify your model very often. Set up the skeleton. Create 2 1-dimensional arrays, one for the real part of the dual quaternions, one for the dual part. Fill each with the appropriate quaternions. Note: Quaternions are in xyzw format, where xyz is the imaginary part. Pass the arrays to the uniforms u_BoneQReal and u_BoneQDual, then render. Textures in the example are from Kay's Blog. EDIT (2013-12-14): The vertex shader is now rather full-featured. 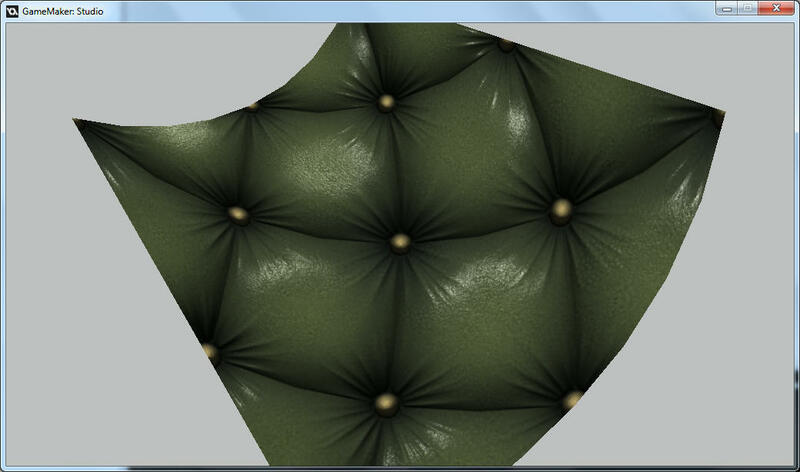 The fragment shader is not complete, but has an implementation of relief mapping. When I get the fragment shader and a full example done, I'll update the demo. EDIT (2013-12-17): Relief-mapping bug fix. Added relief-mapping demo. Fragment shader/example still incomplete. EDIT (2014-02-06): I'm moving on to greener pastures (C++ and SDL). I've uploaded my latest version of this project, which includes a script for setting the dual quaternions; all you need to know is how to use regular quaternions, which is very basic knowledge. Edited by Gamer3D, 06 February 2014 - 06:31 PM. Fast Priority Queues - Game Maker's priority queues are O(n). Mine do everything that Game Maker's do, but in O(log n) time. Dual-Quaternion Skinning - Modifying vertexes in GM is slow. This simple vertex shader does the job both quickly and well. Really great stuff! Thanks for taking this forum in a direction it hasn't been yet. i don't like dealing with quaternions component by component. the shader's nice though. I'll read trough the pdf you posted. Also.. thank you for posting that site. Really good quality textures. Edited by Alvare, 18 December 2013 - 01:02 PM. You can manipulate the quaternions however you want, but you must eventually copy them to an array to pass them to the shader. Unless YoYo adds a shader_set_uniform_f_grid function, there's no other choice. A word of warning: Avoid modifying the blend array in scripts, for performance reasons. GM doesn't pass arrays by reference (at least not if the function needs to change it), instead copying the entire array. For 64 dual quaternions, that copies 512 variables (doubled if GM copies the array twice) per manipulation, for about 32000 copies total. If manipulated separately, this can be reduced to 512 extra copy operations, and fewer still if some bones are unused. Would there be an easy way to implement this onto existing models? Live-streaming a GM:S coding session tonight (03-03-2015) - Click here! Thanks! Much appreciated. I´m not a shader wiz, but cool idea! Please let me know if you use/want to use some of my work so i can feature it on my blog, or if you have requests . Yes and no. The tangent space computations are easy to automate, but unless your model format supports skinning (tracking which bones affect each vertex, and by how much), you will need to add the blend weights manually. Something to be aware of is that the shader currently assumes that the tangent space is right-handed. If your UV mapping involves mirrored triangles (or triangles with mirrored UV coordinates), the normal will be computed incorrectly. Negative blend weight (for first blend) indicates that normal should be negated. Ordering the blend weights in decreasing order guarantees uniqueness. Negative blend index (for third blend) indicates that normal should be negated. Ordering the blend indices in increasing order guarantees uniqueness. Okay, so that would be for an animated model, right? What about simple D3D models (e.g. imported from an .obj) that are rotated once, such as trees, benches, barrels etc. ? My guess is that this should be easy. The other thing i'd like to add would be FPS weapons, say, a gun with normal mapping that changes as you rotate the character. Now i'm kind of a noob when talking about tangent spaces, blend weights and what not. Would you be able to create a simple example of some kind? Thanks a ton in advance! Blend weights are only important for animated models. For a static model, this particular shader is overkill; you could (probably) remove half of its instructions, or more, and still have the important parts for static models (for a static model, all you really need to do is transform the position to view-space and rotate the tangent space). Support for both left and right-handed tangent spaces. A better implementation of normal mapping. The current fragment shader is severely limited (it's just a placeholder, after all), and may not give proper results if the model has been scaled non-uniformly. Possibly switching from the TBN matrix to its inverse. Examples of shaders optimized for specific situations. For example, a separate vertex shader dedicated to static models and a vertex/fragment shader-pair for transformations consisting only of rotation, translation, and uniform scaling. Examples of how to use tangent-space for various effects (Like normal mapping, parallax mapping, etc. ), with discussions of exactly why it is used in that fashion. EDIT (2013-12-17): I have crossed out all the features I have completed at this date. Edited by Gamer3D, 18 December 2013 - 04:45 AM. Although.. it will make distant textures appear even more crispy when not using mipmapping. There's also alot of work in getting all these shaders combined, right? Shoot, I need to animate 3D hair and to bend models to move/animate arms, legs, etc., and this looks like what I need to understand. *sigh* I really need to learn about shaders. Even though I don't understand it enough to implement it as I need to, thanks for this. I'm sure I can learn something from it if I can get enough free time to learn about shaders. The script shdr_skindq_set_blend has been provided to permit easy use of bones (it simplifies user effort to supplying a position and quaternion). The work-in-progress script shdr_skindq_set automatically sets many variables, a process which includes extracting the camera location from its matrix. The vertex shader now uses the preprocessor to allow easy removal of unused features. For example, if you're not using relief mapping, you can--by commenting out a single line--turn off the additional calculations required for the effect. Demo, with examples of various effects and more comments on why each choice was made. Choose additional effects to demonstrate. I've got normal mapping and relief mapping, but I might want to improve the whole thing by choosing a different lighting model, adding reflections, etc. Fully comment the fragment shader. Release GFX-card accelerated relief map baking software. "Baking" additional visibility information permits martini-stepping, an improvement I made to relaxed cone-stepping, which is again an improvement over searching linearly. Create command-line relief map baking software with support for batches. Edited by Gamer3D, 18 December 2013 - 06:41 AM. Wow that looks incredible! Have you tried this on other textures / shapes? Was just curious as to what performance is like ! Great job! I have tested the algorithm on other textures, including the classic lion sculpture. In each case, image quality was approximately as good as for the chesterfield texture. The following benchmarks are created on an Ivy Bridge integrated graphics chip. Ahh nice! I really can't wait for this to be fully featured, Just curious, do you know of any good software for generating relief maps? I tried a few i found online but they didn't seem to work. Also, in the future, would you be willing to create a stand-alone demo showing off the relief mapping alone, without the DQ skinning, and just on a regular model. This is going to look incredible on things like walls and floors! Crazybump seems to be the gold standard. Not sure if free. Also, simply importing a relief map is insufficient for use with the relief-mapping part of the shader. The ray-casting code I wrote uses additional information about the texture, so to use a relief map, you must first process it (I've made a tool for that, but its interface needs a bit of work before release) or switch to a linear search (there's a line in the fragment shader for you to uncomment). Once that line is removed, the shader will no longer perform any skinning operations. Currently, the defined uniforms and vertex attributes remain the same, but this isn't particularly difficult to alter. The reason I don't automatically disable them is that it would require changing a lot of non-shader code after each revision (need to remove requests for uniforms and alter the method used for building the vertexes). Ahh k, yeah i use Crazy bump atm for normal maps, wasnt sure if the relief ones needed a different technique, Looking forward to being able to use your program. Great job so far anyway! Red channel: Depth map (full red for maximum depth, black for details at the surface). Green channel: Square-root of slope of relaxed cone. Blue channel: Cylinder radius, as a fraction of cone radius at one unit above cone vertex. Shaders in Large rooms don't load right?